I made this for dinner a couple of weeks ago when it was a little warmer and not so rainy. My husband and I had been golfing all day so I wanted something on the lighter side and something that wasn’t a pain to make, so this worked perfectly. Cabbage rolls encasing a filling bursting with unique flavors, these are every bit as good as they look. If you’ve never tried soy crumbles before, don’t let the ingredient deter you from making this dish. They can be found in the frozen foods section of your grocery store and taste just as good (if not better) than ground beef. We ate outside in our backyard on a blanket with fresh lemonade and the sunset, it was a perfect meal! Start by cooking your rice, you’ll need 1 cup cooked brown rice. Preheat your oven to 400 degrees and spray a 9 inch square baking dish with a nonstick spray. Bring a large pot of water to a boil. 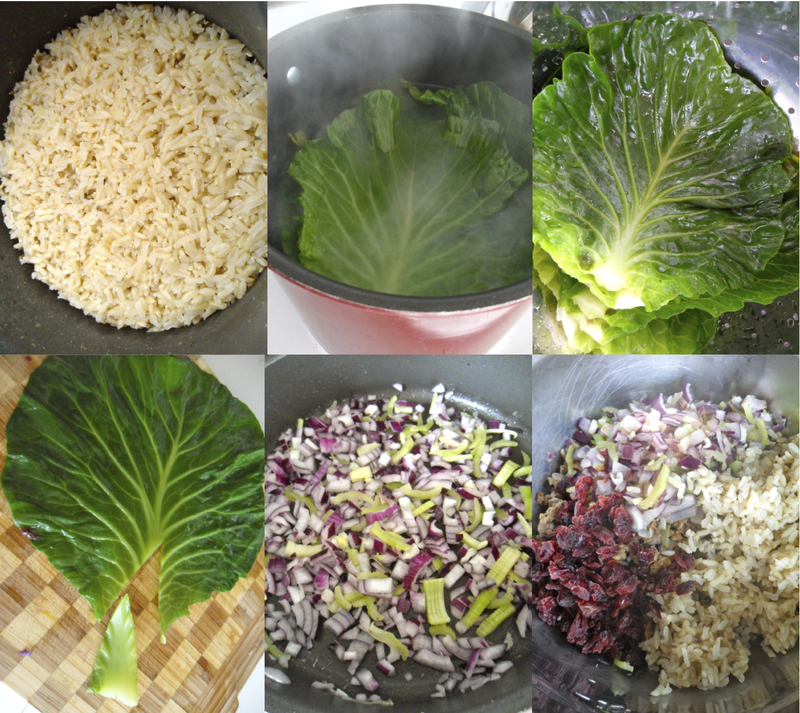 Add in 8 large green cabbage leaves and return to a boil. Cook until the cabbage is pliable, about 8 minutes. Drain the cabbage in a colander and rinse under cold running water to stop the cooking. Transfer to a cutting board and cut out the thick ribs. To prepare the filling, spray a medium skillet with nonstick spray and set it over medium heat. Add 1 finely chopped onion and 4 thinly sliced celery ribs. Cook, stirring often, until softened (about 5 minutes). Add in 3 minced garlic cloves and stir for about 30 seconds until fragrant. Transfer the vegetables to a large bowl and stir in 8 ounces frozen soy crumbles, 1 cup cooked brown rice and 1/4 cup chopped dried cranberries. 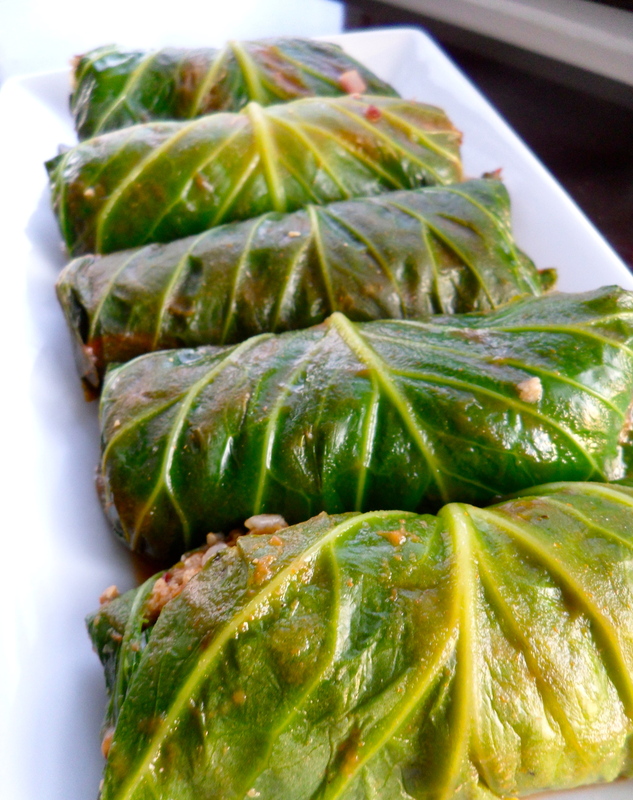 Add about 1/4 cup of the filling to each cabbage leaf and roll them up tightly (some of them will break open, don’t worry). Add all the rolls to your baking dish, seam side down. Whisk together 1 1/2 cups vegetable stock, 1 (8 oz) can no salt added tomato puree, 2 tbsp cider vinegar, 2 tbsp light brown sugar and 1/4 tsp black pepper and then pour that mixture over the rolls. 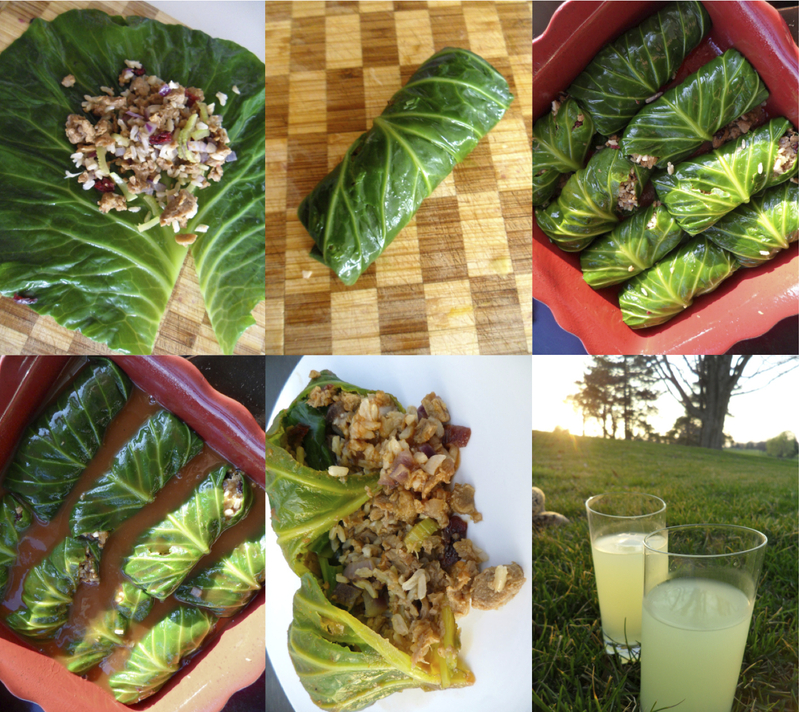 Cover the dish with foil and bake until the cabbage is tender, about an hour and 15 minutes. looks delicious – I’ve added it to my ‘to cook’ list!